Motorcyclists tend to be risk takers. Street riders risk riding in between lanes or weaving in and out of traffic and dirt riders risk riding where there are no traffic signals, stop signs or roads to follow. Both risk their bikes being stolen. Nothing is wrong with any of that, but taking risks on insurance is where you need to draw the line. Liability insurance is important to protect you in case of injury to you, injury to a passenger or injury to someone else or their property. Liability insurance will cover medical expenses for both. Accident damage and medical bills add up painfully fast and can throw families quickly into financial distress. Any form of accident affects emotions and the last thing you want to worry about is how to pay those bills. Depending on your coverage, you can use the insurance benefits to cover repairs or replace the bike in the event of an accident or theft. 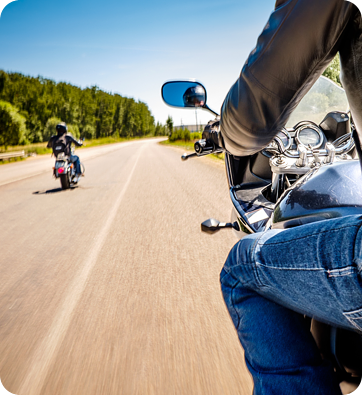 Premiums for Motorcycle Insurance are determined by your age, driving experience, value of the bike, and other factors. Our experts will talk you through the process of determining the coverage you need and will give you a quote for the best possible rates. InsureLine Brokers (Surrey Westgate). Independently Owned & Operated.